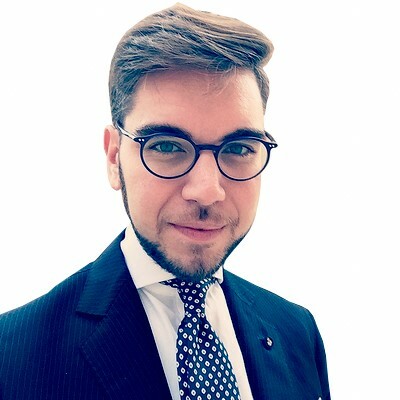 Fabio Adernò is enrolled with the Bar Council of Rome. When he was 29 years old he gained the title of Lawyer of the Apostolic Tribunal of the Roman Rota, and this authorised him to to plead before any Ecclesiastical Court in the world, at the courts of the Apostolic See (the Roman Rota and the Supreme Court of the Apostolic Signet), at the Vatican Courts of the Vatican City State, as well as at the Courts of first and second instance of the Italian Republic. He obtained a diploma in Canon Law at the Faculty of Canon Law at the Pontifical University of Holy Cross in Rome, with a thesis on "Jus in corpus in the canonical doctrone related to marriage". Subsequently, he achieved his PhD in Canon Law at the same university with a thesis on " Penalty and Penance in the Discipline of the Ancient Church in the Writings and Thought of Giuseppe d’Ercole". Following his doctorate in canon law, then he continued his studies, obtaining a Master’s degree in Law with a thesis on " the jurisditional ecclesiastical competence in Italy". During his doctoral studies he has been appointed as Defender of the Bond at the Regional Sicilian Ecclesiastical Tribunal, and after he obtained the Diploma of Rotal Lawyer, he was immediately appointed as "Second Notary Assistant" at the Apostolic Tribunal of the Roman Rota. In 2013 he received the title of "Peritus" (“Expert”) in ratum et non-consummatum (ratified and non-consummated) and invalidation ordination cases , so is Extraordinary Commissioner for the Defence of the Bond in "super rato" cases of the Sacred Roman Rota. As an expert of Canon Law he is also Teaching Assistant of Canon Law and Ecclesiastical Law at the University of Catania and at Pegaso Telematic University. He is a Member of the Sovereign Military Order of Malta, he is a passionate lover of Order Law and noble Law. From 2014 is member of the Rotary Club of Catania, D. 2110 - Sicily & Malta. He is italian native speaker, he speaks fluently English and Latin and he has also a good knowledge of french, spanish and portuguese.